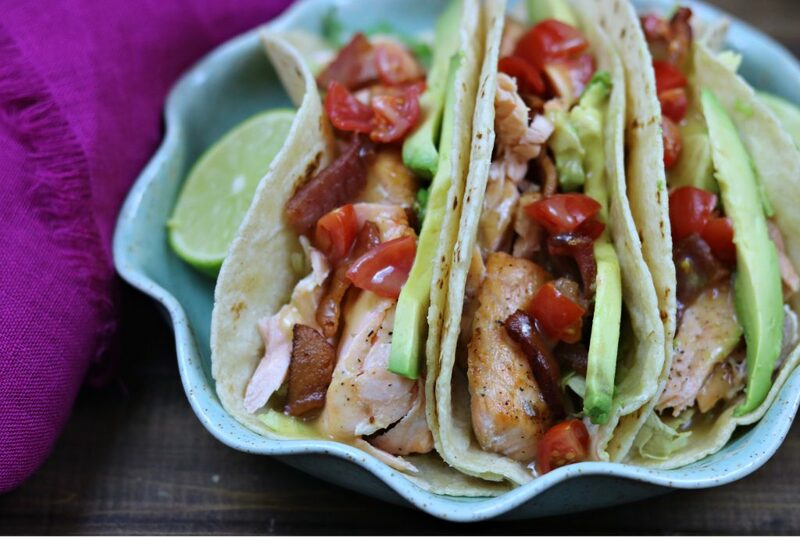 Pan-seared salmon is paired with crispy bacon, lettuce, avocado and tomatoes, topped with honey mustard and wrapped in warm tortillas for a delicious taco you won’t soon forget! Original post June 5, 2012. Updated February 13, 2019. I have been doing this taco thing for quite some time now. And while I typically post the recipes on, you know, Taco Tuesday, I thought I’d switch it up a bit this week. Because, while I may practically live for Taco Tuesday, that doesn’t mean that we can’t enjoy tacos any day of the week! 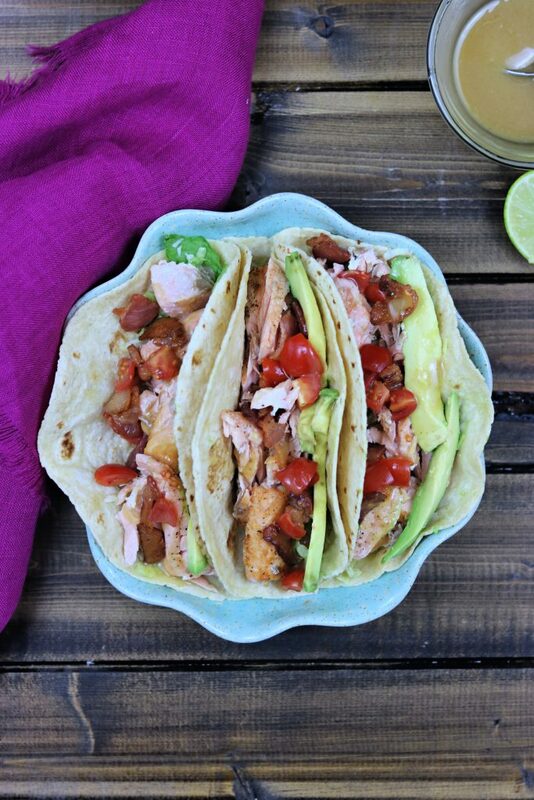 And these salmon blt tacos, my friends, needed to be updated and shared with you before another week passed. While I love pretty much all seafood, salmon is by far my favorite fish to eat. I also like to switch things up and keep variety in our dinners, so I’m always looking or new ways to prepare salmon, chicken, etc. so that the whole family is enjoying the food and not getting tired of what mama is making. 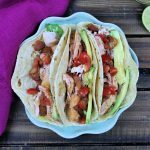 And these tacos, with their perfectly flaky salmon, crisp bacon, shredded lettuce, tomatoes AND avocado – are just about the most perfect thing you’ll ever put in your mouth. While I’ve recently had to come to terms with the fact that neither my husband or my toddler are fans of shrimp (my fav! ), I am thankful that they both love salmon. Nat has always loved fish, especially salmon, and I know that is not a super common trait among 2 year olds. I’m keeping my fingers crossed that the shrimp dislike is purely textural and she’ll grow to love it like her mama. In the meantime, I’ll take the love of salmon in its place. 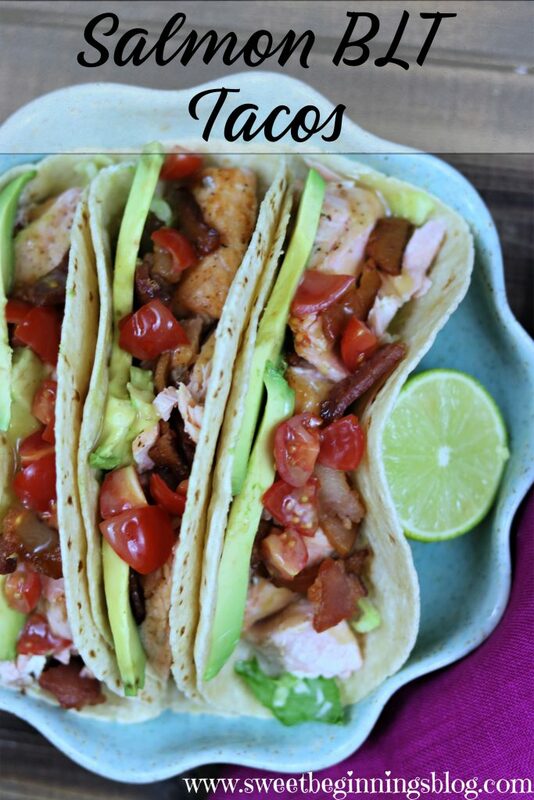 And she loved all the components of these salmon blt tacos. Well, maybe she didnt’ eat the tomatoes or lettuce, but she devoured the salmon, bacon, and avocado. Oh, and “dip” is her new favorite dinner-time word. Can’t say I blame her. Sauce (or dip, in her case) is life. So, I may have strayed from my typical posting day, but I think it was justified. Besides, that just means one less day before the next taco post! 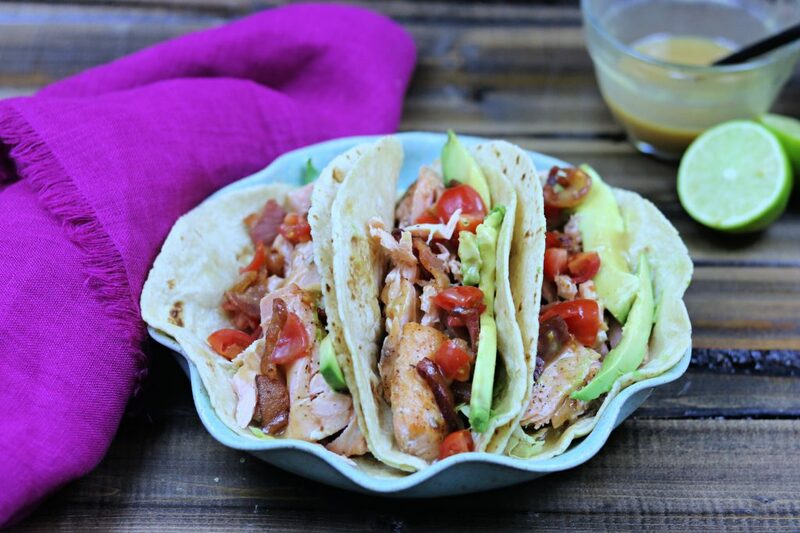 Pan-seared salmon is paired with crispy bacon, lettuce and tomatoes, topped with honey mustard and wrapped in warm tortillas for a delicious taco you won’t soon forget! Cook your bacon in a skillet over medium heat until browned and crisp. Remove to a paper towel-lined plate to drain grease off. Once cooled, chop or crumble by hand and set aside. Using the same skillet as the bacon (you can drain the grease or leave it – up to your preference! ), over medium-high heat, place the salmon – skin side down if it has skin – and season with salt and pepper. Cook for 3-4 minutes, then gently flip them over. If it has skin, remove the seared skin now, using tongs. Cook for and additional 3-4 minutes and then turn over once more to sear the side the skin was on. (If your’s didn’t have skin, you can skip the second flipping) Cook for and additional 2-3 minutes, breaking up into large chunks with a spatula. Remove from heat. Warm your tortillas and top with shredded lettuce, salmon, tomato, avocado, crumbled bacon and drizzle with honey mustard dressing. * you can use store bought dressing, or combine dijon or course grain mustard and honey together at a 1:1 ratio, then season with salt and pepper to taste. You can add more honey if you’d like it sweeter, or more mustard if you like it tangier. Super simple and so delicious! YUM! I love salmon, I love tacos, I love avocado, and of course, I love bacon! NEED TO MAKE!!! !